The leaves have fallen, and that means log splitting season is here again. 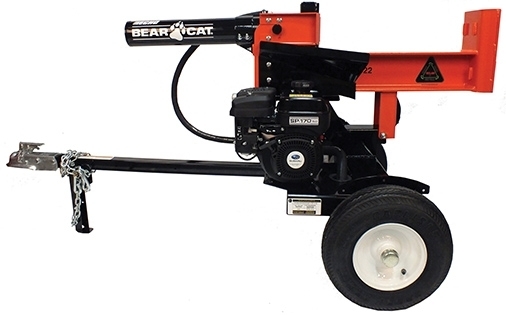 If you have an Echo Bear Cat LS 22, there are a few things you should know about maintaining and operating your log splitter so you can get the most from it. The LS 22 is powered by a Subaru SP170. For detailed use and maintenance information, check the engine owner’s manual: service intervals and methods can vary widely from version to version. Before shutting off the engine, move the throttle lever to “slow” and let the engine return to idle speed. This makes shut down easier on the engine and the hydraulic pump. When operating at temperatures below 20ºF, let the engine warm up and fully extend and retract the cylinder four times to warm up the hydraulic fluid. Using the log splitter in temperatures below 0ºF can damage the hydraulic system. The hydraulic tank is built around the trailer axle. To check the level, set the splitter on a flat surface with the jack extended, then remove the filler cap on the left side of the tank. The entire hydraulic system holds four gallons of Dexron III/Mercon automatic transmission fluid. The hydraulic filter should be changed after the first 50 hours of use, then every 200 hours thereafter. To install a new filter, lubricate the seal with Dexron III, tighten it by hand, then tighten it an additional ½ turn with a filter wrench. Check the alignment of the splitting wedge spacer plates before using this equipment. If they’re misaligned, the wedge won’t travel in a straight path, causing it to rub against and can damage the splitter. It’s normal for the plates to move with use, especially if the full power of the hydraulic system is used repeatedly to cut difficult logs. To adjust the plates, loosen the three bolts clamping them to the beam. The bolts and nuts do not need to be removed. Push the plates against the beam, positioning them so they’re parallel with the wedge, and tighten the bolts by hand. Once everything is lined up, torque the bolts to 110 ft-lbs. Check the alignment by extending and retracting the wedge. If the plates are in the right position, the wedge will move without binding. The wedge is bolted on using a Grade 8-rated black oxide ½ by 4-inch carriage bolt. If this bolt is damaged, replace it with an identical bolt before using the splitter. When installing, position the cylinder ram so it’s against the wedge and tighten the bolt to 110 ft-lbs. The splitter can handle logs that are up to 24 inches long. Both ends of the log must be cut square. Lift the log into place by picking it up by its sides. Set it on the tray so that the wedge will cut with the grain. Stand behind the splitting area and use the controls to extend the wedge. If you need to support the log, place your hand on the side, well away from the wedge. Once the log has split or the wedge is fully extended, use the controls to retract the cylinder. Wait until it’s fully retracted before removing the log pieces. In most cases, it’s best to use the beam in the horizontal position. However, having it in the vertical position makes it easier to split large logs. It’s best to keep the trailer hitched to the tow vehicle for stability when cutting vertically. To switch modes, pull out the spring-loaded pin on the main beam and tilt the beam until it locks into place. When placing a log on the end plate, turn the log until it leans against the beam. Before towing, lock the beam in the horizontal position and fully extend the wedge to increase the stability of the trailer. As with any trailer, you need to make sure the safety chains are attached to the tow hitch and the hitch bolts are tight before transport. The trailer is designed for a maximum towing speed of 45 mph. Need Something for Your Log Splitter? Shank’s Lawn Equipment is an authorized dealer for a wide range of professional outdoor equipment brands including Echo Bear Cat and Subaru Power. That means we can service your equipment or provide you with the parts you need to do it yourself. Our shop is at 4900 Molly Pitcher Highway at the south end of Chambersburg, PA. We also ship parts and accessories across the United States and Canada. If you need something for your Echo Bear Cat, visit www.shankslawn.com. This entry was posted in Uncategorized and tagged Echo Bear Cat replacement parts, Echo LS22, LS22 log splitter. Bookmark the permalink.